When one device’s analogue output feeds another’s input, the circuitry combines to form a voltage divider. Can I use the headphone output (Output 9-10) on an RME Fireface 800 audio interface to feed a click track to an IEM (In-ear Monitor) transmitter for a drummer? According to the manual, the main output (1-8) line outs can all produce up to +19dBu (for 0dBFS in high-gain mode) with an output impedance of 75Ω. In contrast, the headphone output specifications state a maximum output of +17dBu and an output impedance of 30Ω. So the output levels are roughly comparable but the impedance is not — and I don’t really understand what this means in real terms. Is the headphone output sufficient for the IEM transmitter? All modern analogue signal interfacing employs a ‘voltage-matching’ paradigm, meaning the aim is to transfer as much of the source’s signal voltage as possible. A lot of confusion over impedances relates to the concept of ‘impedance matching’, which dominated pro-audio until the early ‘70s — essentially this was because the core technology was borrowed from the telephone industry, where cable impedance matching was critical due to the wires stretching between cities! While this concept is entirely valid in telephony, and with high-frequency signals such as RF, video, and digital audio (any situation where the cable is very long in relation to the signal wavelength), it’s completely obsolete and irrelevant in the world of analogue audio interfacing in the recording studio. In a voltage-matched environment the requirement is to ensure that the signal voltage generated by the source is passed in its entirety (or as close as we can get), and to achieve this goal we need the destination’s input impedance to be very much higher than the source’s output impedance. The reason is obvious if you consider Ohm’s Law: the source’s output impedance forms a simple potential divider with the destination’s input impedance. In the diagram, V-in is the source’s output signal voltage and Z-out is its output impedance. Z-in is the input impedance of the destination and V-out is the signal voltage it receives. 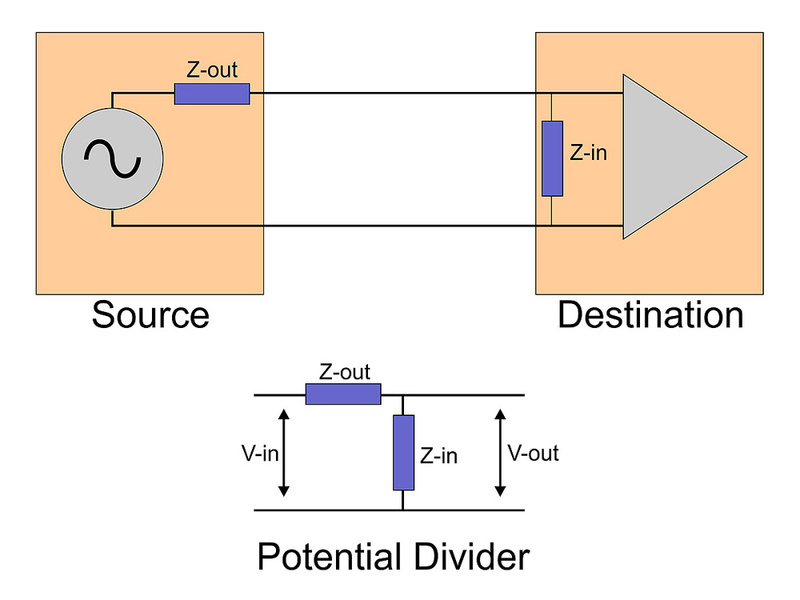 To maximise the received signal voltage, Z-out should be as low as possible and Z-in as high as practical... and the typical implementation makes Z-in about 10 times greater than Z-out. Consider a typical microphone and mic preamp, for example: the standard mic output impedance is between 150Ω and 200Ω, while the standard preamp input impedance is between 1.5 and 2.5 kΩ — in other words, about 10 times higher! Active line-level outputs usually have an output impedance of 100Ω or less as well, but most line-level input impedances are at least 10kΩ and often as high as 47kΩ. Clearly, this is much more than 10 times the output impedance, but there’s a reason for that... Whereas a mic is (normally) only ever connected to one preamp input, it’s not unusual to need to distribute a line-level signal to multiple destinations (eg. to several tape recorders plus a monitoring system). For this reason, line inputs are sometimes referred to as ‘bridging inputs’ and the idea is to enable the passive distribution of one line-level source to several destinations simultaneously. Multiple destinations can then ‘bridge’ the input signal without ‘loading it down’. In this scenario, with a number of destinations wired from the same output, there’s still only one output impedance to consider (Z-out in the diagram), but all of the separate destination input impedances (Z-in) are effectively placed in parallel with each other. Parallel resistances act to reduce the overall resistance, so feeding two destinations results in a halving of the total combined input impedance, four will quarter it, and so on. This means that slightly more of the signal voltage will be developed across Z-out and less across Z-in, thus slightly reducing the signal voltage received by each destination. Consequently, it makes sense to have as high an input impedance as is practical to minimise this loss of signal level whenever additional destinations are wired across the same source! To put some real-world numbers on this, if the source’s output impedance is 100Ω, and the destination equipment all have 10kΩ input impedances, then splitting the signal to feed two devices results in a signal loss at each input of just 0.17dB, and you could share the signal between six devices and still only lose 0.5dB overall. Reducing the output impedance to 75Ω instead and increasing the destination input impedances to 47k gives a negligible 0.03dB signal loss for two destinations, and allows almost 40 devices to share the output signal before the loss reaches 0.5dB! That’s why bridging inputs with high impedances are so useful! But relating this back to your original query (“at last!” I hear you cry...), the output impedances of the two RME outputs are both below 100Ω, which is typical and of no concern at all. However, there’s a more important specification you haven’t told me — and that’s the input impedance of the IEM system you plan to use. As I hope you’ll now appreciate, though, as long as that is more than 10 times the 30Ω to 75Ω output impedances of your interface, then all will be well. So an input impedance of anything more than 1kΩ will work perfectly, and in reality I suspect the IEM transmitter will present an input impedance more like 10-50 kΩ anyway. In other words, there shouldn’t be a problem at all — but do be careful when setting the levels for the first time!